This week’s Lenten Prayer guides will include a daily quote from English mystic Julian of Norwich. Who is Julian of Norwich? English mystic of the fourteenth century, author or recipient of the vision contained in the book known as the “Sixteen Revelations of Divine Love”. According to her book, this revelation was “shewed” to her on 8 or 14 May (the readings differ), 1373, when she was thirty years and a half old. This would refer her birth to the end of 1342. Her statement, that “for twenty years after the time of this shewing, save three months, I had teaching inwardly”, proves that the book was not written before 1393. Conceptually, I have known of “thin places” for a number of years but never really gave it a whole lot of thought. Thin places, like many other Celtic traditions, hold a certain mystical fascination for me. The Celts developed this sort of thinking long before the long arm of western Christianity invaded their world. Simply put, a thin place was and is just that, a physical location where the separation between the divine and the earth is thin. I believe we can expand that beyond the borders of Ireland and Scotland and say that we have all experienced thin places in our lives – those mystical, unexplainable touches with the divine that both test and strengthen our faith. Contemplative Franciscan Richard Rhor calls this place “the edge “, and suggests we should cultivate being there. “The edge is a holy place, or as the Celts called it, “a thin place” and you have to be taught how to live there. To take your position on the spiritual edge of things is to learn how to move safely in and out, back and forth, across and return.” So, how can we find a thin place in our world? Do we get on a plane and fly to Ireland, or can we just go around the block? Let’s do a little background first. 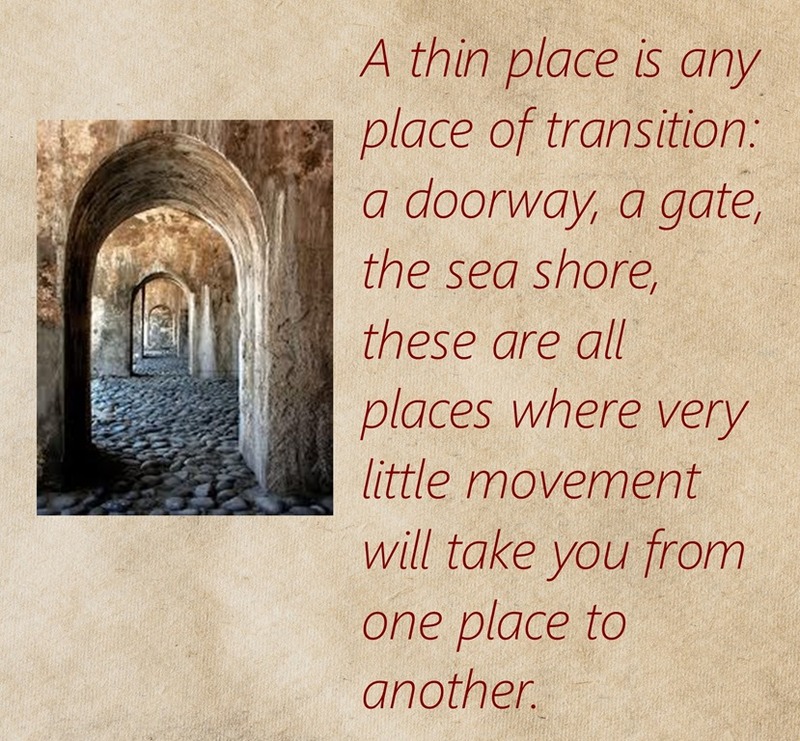 A thin place is any place of transition: a doorway, a gate, the sea shore, these are all places where very little movement will take you from one place to another. My grandfather had a practice of going “visiting” the neighbors where he would always stand on the porch on the outside of the doorway and never go into the house. In spite of that, everyone would say that that Frank had come over to their house that day. The thin places of spirituality are the same way, we are present in both worlds. I will narrow the list down a little by picking three. The first is the thin place of God in the Exodus from Egypt. “For the cloud of the Lord was on the tabernacle by day, and fire was in the cloud by night, before the eyes of all the house of Israel at each stage of their journey.” (Exodus 40:38 NRSV) Perhaps this is the most graphic of all thin places in the Bible because it had a very graphic signpost of God’s nearness. God traveled with them and they saw it, they knew and were blessed by experiencing the thin place. The second is the thin place of any miracle. I’ll pick the Hebrew Scripture story of Shadrach, Meshach, and Abednego. They were local officials of the occupation government of King Nebuchadnezzar. The king had statue of himself built and decreed all subjects to offer worship to it. These men refused saying that they could only worship the true God, Yahweh. He ordered them burned in an especially hot furnace, but they did not perish in the flames. “Then King Nebuchadnezzar was astonished and rose up quickly. He said to his counselors, “Was it not three men that we threw bound into the fire?” They answered the king, “True, O king.” He replied, “But I see four men unbound, walking in the middle of the fire, and they are not hurt; and the fourth has the appearance of a god.”(Daniel 3:24-25 NRSV) Not only were they saved from the execution but God was walking with them in the fire. Not only Shadrach, Meshach, and Abednego but all those present around the furnace were standing on holy ground – a thin place. 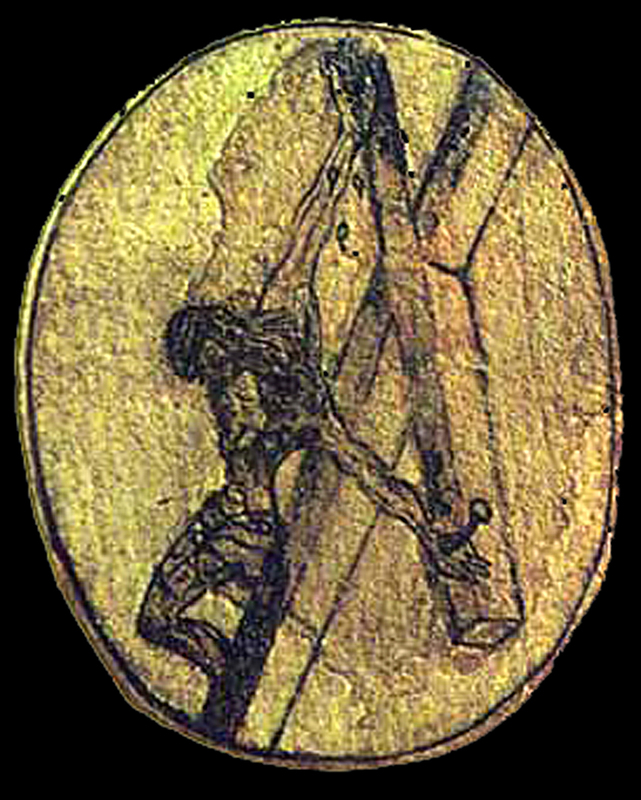 I chose for the third reference the thinnest place that ever existed, the hill of Golgotha. Many would say that this was a place of the melding of heaven and earth. The place where Jesus, God in the flesh, died for the salvation of all. Picture the scene: “It was now about noon, and darkness came over the whole land until three in the afternoon, while the sun’s light failed; and the curtain of the temple was torn in two. Then Jesus, crying with a loud voice, said, “Father, into your hands I commend my spirit.” Having said this, he breathed his last.” (Luke 23:44-46 NRSV)There were so many ways that this scene had become a thin place that I could spend pages talking about it, but instead I just want to say the veil between the celestial and the earthly was extraordinarily thin. Next installment: Relishing your thin places.